This book has two signatures (sewn into separate folds of the cover) which contain secret pockets and compartments (pg. 41 Tabellae Ansata). The artist has written text on the letter "J" which is secreted in the various pockets involving the reader in the book at every turn. 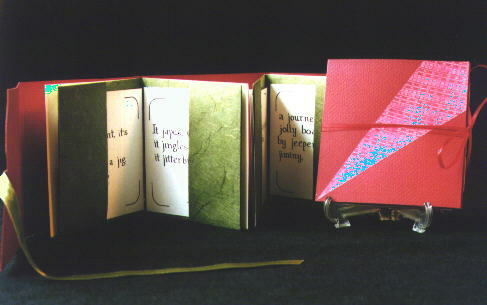 The origami signatures were of dark green oriental paper and the wraparound red cover was Canson. Paste-paper diagonal/diamond shaped pieces were glued across front and back covers holding the ribbon tie in place.